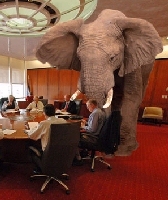 Have you ever heard the phrase, “The elephant in the room”? It’s a phrase that refers to a topic that nobody talks about but it so dominates everybody’s thoughts. Everyone knows the elephant is there but nobody wants to talk about it. There is an elephant in the room during any time being spent with a senior citizen. It is a topic that is blatantly pertinent to anyone in their golden years but it is a topic that nobody talks about either because it’s too upsetting or nobody knows how to talk about it. But it is a topic that weighs on the mind of your senior citizen mom and dad virtually every day. The elephant in the room is death and the end of life issues that are ahead for every senior citizen at some point or another. - The condition of the Last Will, Living Will, Medical and Legal Powers of Attorney, Living Trusts, etc. - Do not Resuscitate and other advance directive document decisions to give to end of life medical personnel. - A review of insurance and the location of other financial documents that you, the executor of the Will or the person who has Power of Attorney will resolve. - Any desires the senior citizen might have about funeral arrangements. In order to be able to discuss the end of life and issues related to death, you will have to be at a point emotionally that you can deal with the topic yourself. Many of us bury our thoughts of death in a mental trick we play that seems like we think we will not have to go through this part of life. We do that perhaps because we prefer to think about life or because we are uncomfortable about discussion of the afterlife and religious ideas. So to get ready to be able to be a good caregiver and counselor to your aging mom or dad, you should sit down and get some peace and resolution about the topic yourself. If that means confronting your religious anxieties, well, that is part of adulthood and those who are depending on you including your aging parents and your children may be looking to you for some answers in that area. It will take some courage but face those issues so you can be ready to help your parents face them too. If you have a religious faith and your parents share that outlook, this is the time to review the afterlife assurances that come from your religious upbringing. By spending time with your mom or dad reviewing the doctrines of heaven and the comfort those religious texts brings, you can give them renewed hope and peace about the coming of death because they will know that passing from this life is not the end. Don’t let the elephant stay in the room. Confront the issue of death with your aging parent or parents and do so with compassion and kindness. If you do, you will help your parent reach a place of peace and acceptance about what is going to happen that will benefit them for the whole of their golden years remaining on this earth. If you don't, be prepared to supply a lot of peanuts!